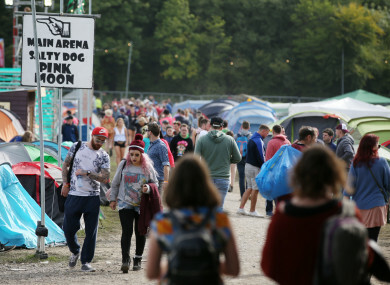 GARDAÍ HAVE WARNED the public to be wary of fake ‘print-at-home’ Electric Picnic tickets that are being sold online. The three-day festival is on next weekend in Stradbally, Co Laois and attracts tens of thousands of festival goers each year. Tickets to the event are sold out, while a weekend camping tickets put up for resale are going for around €700. Today Gardaí advised the public that print-at-home tickets aren’t being used for Electric Picnic and warned that people shouldn’t buy tickets from unauthorised or unknown sources. “An Garda Síochána is also warning that third party payment sites are being used to take money off unsuspecting fans in these scams,” they added. Detective Chief Superintendent Pat Lordan, of the Garda National Economic Crime Bureau, today said “We are working closely with the organisers to prevent fans being left disappointed by the activities of criminals. It is important to stress that the print-at-home format is not being used for Electric Picnic and that the public only buy tickets from authorised sources. Email “Public warned about fake print-at-home Electric Picnic tickets”. Feedback on “Public warned about fake print-at-home Electric Picnic tickets”.